The Gamer’s Brain: How Neuroscience and UX Can Impact Video Game Design. 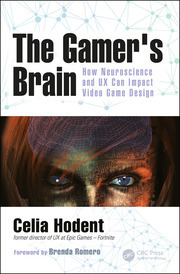 Celia Hodent is recognized as a leader in the application of user experience and psychology in video game design and in the development of UX strategy and process in game studios. She holds a PhD in psychology from the University of Paris Descartes-Sorbonne, France, where she specialized in cognitive development. In 2005, Celia stepped aside from academic research to work with an educational toy manufacturer, VTech, and then entered the video game industry. Celia is also the founder and curator of the Game UX Summit, which launched in Durham, NC, in May of 2016, hosted by Epic Games. She has worked on many projects across multiple platforms (PC, console, mobile, and VR), including the Tom Clancy’s Rainbow Six franchise, Star Wars: 1313, Paragon, Fortnite, and Spyjinx. Click here to download a free chapter of The Gamer’s Brain: How Neuroscience and UX Can Impact Video Game Design. Congratulations on the publication of your book, The Gamer’s Brain: How Neuroscience and UX Can Impact Video Game Design, what do you want your audience to take away from the book? Thank you! My book was designed to help game developers identify the main ingredients for crafting successful games, by understanding player psychology on one hand, and guidelines from the user experience (UX) discipline on the other hand. For example, the book explores human brain capacities and limitations in terms of perception, attention, memory, motivation, and emotion. It explains the science behind what makes a more compelling experience for players and how to iterate in the most efficient way. Creating great games is a costly, lengthy, and generally difficult endeavor, and it is therefore critical to anticipate how your audience will interact with your game and what will make them engage with the experience. This is what I hope my audience will take away from the book: identify the ingredients that make video games engaging and fun so they can use them to come up with their own successful recipe. Along the way, I also hope my readers will have a better appreciation of the complexity of the human brain so they can recognize brain/mind myths more easily and not fall prey for the “neuro-hype”, overused and abused by many. The book offers an introduction to both user experience and cognitive science as applied to video games. As such, it is mainly targeted towards game developers, although it is also accessible to anyone interested in how video games are made or in how the brain works as related to playing video games. Specifically, the book is targeted at creative directors, designers, gameplay / UI programmers, and artists, as the content of the book covers topics that directly apply to the challenges they face on the job. Professional game UX practitioners (interaction designers, user researchers, UX managers, etc.) should already know many of the concepts tackled in this book, although it can provide them with some good reminders. The content of this book should also be valuable to UX practitioners who are not familiar with the game industry but who are interested in learning about it. Upper management, producers, and support teams (quality assurance [QA], analytics, marketing, business intelligence, etc.) should gain some perspective regarding the importance of considering user experience in shipping a more engaging game faster. Lastly, the main purpose of this book is to provide a thorough overview about game user experience in order to facilitate collaboration and communication, and develop UX maturity across the whole studio. Therefore, any game developer should get useful insights from this book. There are many interesting books about neuroscience and the impact of psychology on our everyday life, books about user experience (UX) and its impact on design, books about user research, or about game design, but to my knowledge there are no books addressing all of these elements while tailoring the content specifically towards video game development. This book combines knowledge in psychology and neuroscience to explain where UX guidelines come from and how to apply these guidelines specifically to game design. It provides an overview of how the brain learns and processes information. It provides a down-to-earth framework and guidelines, illustrated with numerous examples from video game titles. It covers all aspects of game UX as a discipline: UX principles (from human factors psychology), design thinking, game user research, game analytics, and UX strategy at both a project and studio level. This unique blend of content offers readers a perspective that they cannot find elsewhere. I’ve offered multiple training sessions about how the brain works and about game UX across the years, but writing this book was a unique forcing function to clarify my thought process and develop a concise framework and guidelines for my audience. I very much enjoyed that aspect of the writing process. I have in PhD in psychology from University of Paris-Sorbonne where I specialized in cognitive development. My dissertation was about the impact of language in the development of the concept of numbers in toddlers, comparing French children with English children. The impact of the environment on learning has always been a fascinating area of research to me. One of the most influential figure in my life as a researcher in psychology is probably Daniel Kahneman, who was among the first to study cognitive biases, which you could describe as optical illusions for reasoning. Along with Amos Tversky, Kahneman demonstrated that the human mind uses shortcuts of intuitive thinking (rules of thumb in judgment) that result in making predictable mistakes in our reasoning. Daniel Kahneman, who received the Nobel Prize in Economic Sciences in 2002, explains this phenomenon brilliantly in his book, Thinking, Fast and Slow (Kahneman 2011), which truly is an eye opener for those who are not already familiar with his research. Another great influencer in my life, this time on the educational and developmental psychology side, is Seymour Papert. Papert was a pioneer in using computers for educational purposes as early as the 1960s. Instead of determining how computers can be used to teach children some curriculum, he thought of ways in which children could program computers to make them do something they were interested in (e.g. using the LOGO programming language to draw with computers), while learning along the way. He understood that children learn best when they can experiment with the material in a meaningful and concrete situation. This mindset, described in his seminal book Mindstorms: Children, Computers and Powerful Ideas (Papert, 1980), was revolutionary back in the 1980s and, unfortunately, is still not championed enough today. About myself? Well, I used to be the lead singer of a rock band in a previous life, if this counts as unusual. Regarding my writing and teaching style, I always try to be accessible, without steamrolling too much the subtleties that are very important in science. Academic people can be perceived as intimidating or even annoying if their audience feels they are being condescending with them. I strongly believe that we need to build more bridges between academia, professionals, and the public. Therefore, I try to speak plain English (or French) and be lightweight and approachable while not oversimplifying the science. We can talk about serious topics while still having fun. I believe that learning should always be approached as a fun and playful experience. One of the dangers academics face when trying to be approachable is to lose too much of the complexity and subtlety of science. Unfortunately, some people exploit this caveat on purpose, since it is much easier to captivate an audience with pseudoscience and seduce them with myths. The problem is that this can quickly become very damaging for people’s finances (e.g. scams or dark design patterns), online security (e.g. phishing), health (e.g. spreading the fake evidence that vaccines cause autism), and even in some cases, for democracy (e.g. clickbait articles and propaganda). Real science is much more complex and nuanced, which of course makes it less compelling. For people who need guidance as to how to make their businesses more successful, it’s more seducing to hear neuromyths such as “be more right-brained to succeed” than what science actually says (i.e. “it’s complicated and there is no clear recipe for success”). For all these reasons, I am thinking of writing a book on fake news and manipulation, in the lense of the human brain, to explain how anyone can fall prey to it, and therefore how to recognize it, and how to fight against it. There are two main highlights in my career as a game developer: the first was when Ubisoft gave me the opportunity to create a training session about the brain as part of their Design Academy, back in 2009. This allowed me to exchange ideas with a lot of designers, artists, and programmers and was the stepping-stone for The Gamer’s Brain. My other highlight was working with the Fortnite team at Epic Games: it was the most meaningful project for which I put my UX guidelines and framework into practice, and I was able to do so from the very first steps of the development process. The team challenged me and let me challenge them; we worked very closely together. I’m very proud of their accomplishment with the game and they enriched my thought process considerably. I’ve been reading a lot of academic and professional books lately! The latest non-academic book I read is Stephen King’s Doctor Sleep. The way King portrays tormented and pressured human minds is quite compelling to me somehow. I’m a fan of his work. 1. An amazingly complete introduction to psychology, using examples from video games to make the concepts clear and memorable. 2. An amazingly complete introduction to video game design, using psychology to help design more compelling games.